(Nanowerk News) Does glass ever stop flowing? Researchers at the University of Bristol and Kyoto University have combined computer simulation and information theory, originally invented for telephone communication and cryptography, to answer this puzzling question (Nature Communications, "Mutual information reveals multiple structural relaxation mechanisms in a model glass former"). Watching a glass blower at work we can clearly see the liquid nature of hot glass. Once the glass has cooled down to room temperature though, it has become solid and we can pour wine in it or make window panes out of it. On a microscopic scale, solidification means that molecules have settled into a crystalline structure. And yet, when looked at under the microscope, it appears glass never settles down but keeps flowing, albeit extremely slowly – so slowly, in fact, that it would take over 10 million years for a window pane to flow perceptibly. The researchers discovered that the size of the solid-like regions of the material increases over time and that atoms in the solid-like regions organize into geometrical shapes, such as icosahedra. This puzzle of a material which seems solid to any observer while appearing fluid under the microscope is an old one. And even with the help of today's supercomputers it seems impossible to verify in simulations whether a glass ever stops flowing. To answer the question of what happens at very low temperature, and whether the whole material becomes truly solid, researchers in Bristol’s Schools of Physics, Chemistry and Mathematics led by Dr Paddy Royall and Dr Karoline Wiesner, teamed up with Professor Ryoichi Yamamoto of Kyoto University. 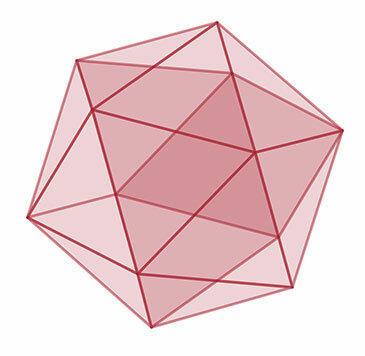 The researchers discovered that the size of the solid-like regions of the material increases over time and that atoms in the solid-like regions organize into geometrical shapes, such as icosahedra. Such icosahedral configurations were predicted in 1952 by Sir Charles Frank at the University of Bristol’s HH Wills Physics Laboratory. Dr Karoline Wiesner said: “Information theory provided us with the mathematical tools to detect and quantify the movements of atoms, which turned out to move as if they were in communication with each other."